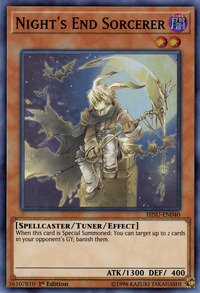 When this card is Special Summoned: You can target up to 2 cards in your opponent's GY; banish them. There is a clear but not so obvious relationship between this Tuner monster, Magical Exemplar and the Synchro monster Tempest Magician. The latter is essentially a fusion of the previous two with Exemplar now brandishing Sorcerer's scythe (she also gets his pet bats). Plus, the combined levels of both of them are an exact fit for the summon of Tempest Magician. 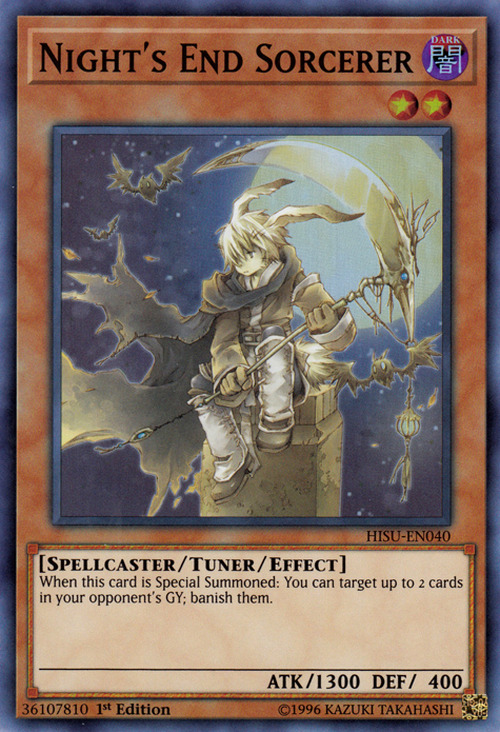 This card's artwork is similar to that of the Charmers, mainly Dharc the Dark Charmer. It also possesses similarities to the humanoid character in the artwork of Droll & Lock Bird. These resemblances most likely stem from the fact that all three cards are designed by the same artist, Akina Fujiwara. The scythe of this monster is transparent. "Night's End Sorcerer's" effect can be activated when it is Special Summoned during the Damage Step. "Night's End Sorcerer's" effect cannot be activated when it is Special Summoned face-down (with "The Shallow Grave", etc. ).